This is a post I’ve been trying to complete for a week now–it’s felt frivolous posting about fruits and freebies when I’ve friends with unwanted lakes in their yards and no power )-: But normalcy is a condition of sanity so it’s back to the kitchen and writing for me. 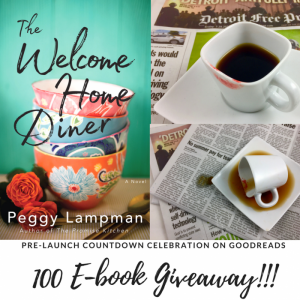 First, I wanted any Kindle readers to have an opportunity to win one of 100 copies of THE WELCOME HOME DINER that my publisher is giving away on Goodreads. So book talk over and back to recipes. Here in Michigan, I’m still finding local peaches and plums at the market. Last week found me in the kitchen with my helper(?) stuffing peaches for a gluten-free friend, just out of the hospital. Some think peaches are best reserved for cobblers, jams and spooning over ice cream — or simply eaten out of hand. They’re also delicious stuffed with a savory. 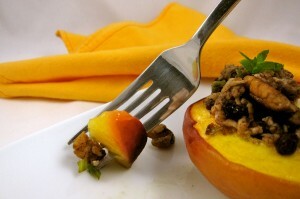 This recipe for Baked Stuffed Peaches with Savory Ground Turkey is gluten-free. If you prefer your stuffing bonded together and don’t have gluten issues, stir a beaten egg into panko or breadcrumbs and add to the recipe. We’re also drowning in off-the-vine tomatoes about now. 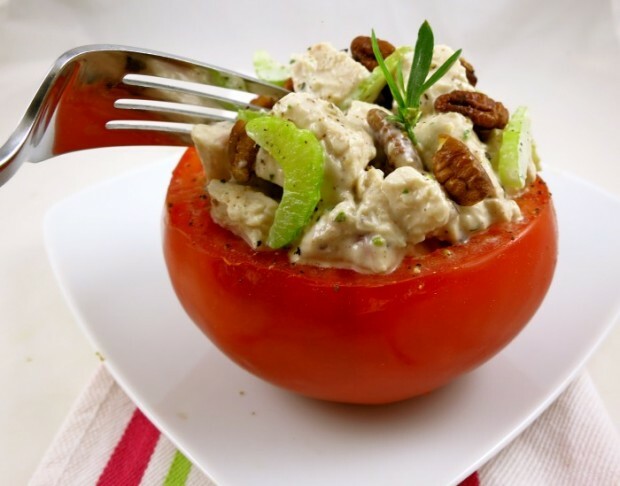 Stuffing an heirloom tomato (and yes, tomatoes–like cucumber– are botanically a fruit) with one of my all-time favorite heirloom chicken salad recipes is a treat. In the linked recipe I make it with tarragon, walnuts and homemade mayo (cover shot). No time to fuss? 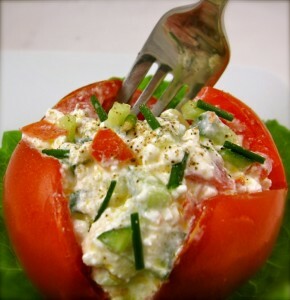 Stir chives, cukes, additional chopped tomato (from your scoop) into cottage cheese and stuff ’em up. 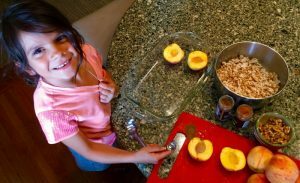 2 Responses to Stuffed Fruits (tomatoes are a fruit) and Free Books! I never thought to combine peaches with savory fillings. Going to try this one, for sure. Thanks! If memory serves, didn’t you mention that you were gluten-free? This recipe is great for that. It’s a wee bit crumbly but for those who don’t have issues with gluten, as mentioned, a bit of panko and beaten egg binds it up. Thanks for the comment, Alison!